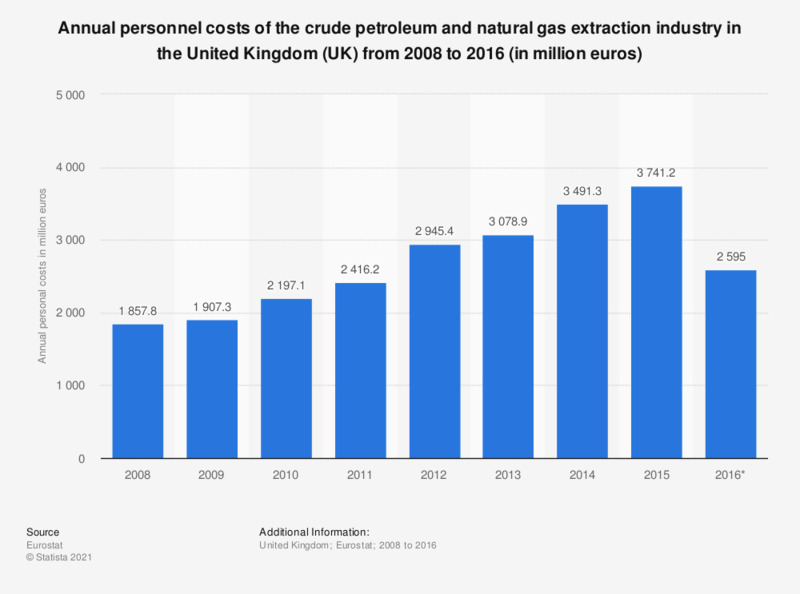 This statistic shows the annual personnel costs of the crude oil and natural gas extraction industry in the United Kingdom (UK) from 2008 to 2015. In 2015, the crude oil and natural gas extraction industry produced personnel costs of approximately 3.7 billion euros. The source adds the following information: "Personnel costs are defined as the total remuneration, in cash or in kind, payable by an employer to an employee (regular and temporary employees as well as home workers) in return for work done by the latter during the reference period. Personnel costs also include taxes and employees' social security contributions retained by the unit as well as the employer's compulsory and voluntary social contributions. Personnel costs are made up of wages and salaries and employers' social security costs." Data coverage corresponds to code B06 of NACE Rev 2. Statistics on "Fossil fuel industry in the United Kingdom (UK)"